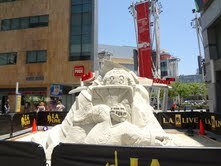 While visiting LA Live, across from Staples Center in downtown Los Angeles, I encountered this very unique Los Angeles Kings sand sculpture (pictured above). The monument was created during the Stanley Cup playoffs and modified for the finals, after the Kings won the cup. One side of the carving features a sand Stanley Cup, with the words “LA Kings Stanley Cup Champions” written in big letters. The reverse side showcases a Kings logo and what appears to be the likeness of goaltender Jonathan Quick. While I was taking a look at the piece, many other people also stopped to snap a few photos of their own. Short of seeing the actual Stanley Cup, this was maybe the next best thing for LA hockey fans. It was interesting to see the ways in which a warm weather city like Los Angeles embraces a cold weather sport like hockey. My guess is that recent NHL championship cities like Chicago and Boston did not go the sand sculpture route. This must be what it's like to “win it all” Hollywood style.